61360 Stonegate Drive Washington Twp, MI. | MLS# 218050927 | The premier resource for all real estate information and services in Metro Detroit. *Freshly Updated! * Brand new carpet throughout & fresh landscaping for the summer! Ponds with fountain! Too much to list! 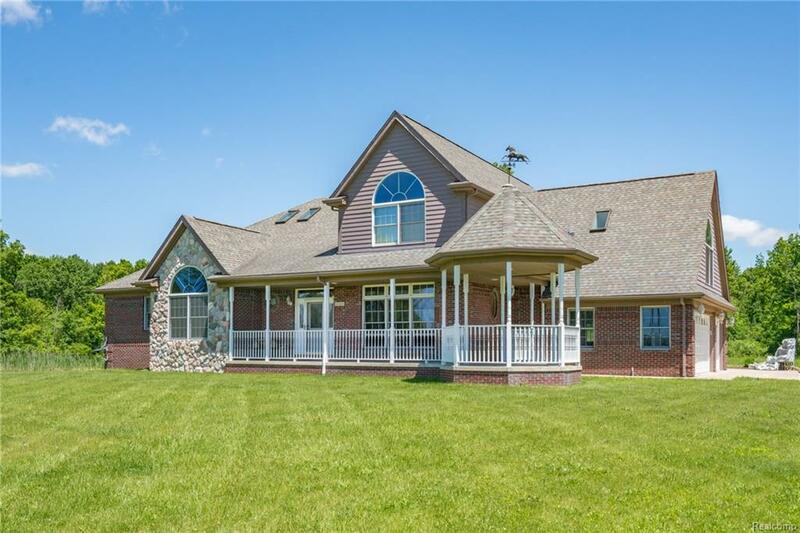 Serene & expansive in beautiful Washington Twp - custom built split level is situated on a premium 2.5 acres with private pond/woods. Enjoy the views from the large stamped cnc patio or relax on the front gazebo porch. The separately heated & insulated outbuilding measures 60x40 with a loft upstairs - finish it to become a work office, man cave, etc! Once you get past the breathtaking outside features you'll find upgraded finishes throughout the interior. Enter the large foyer & you'll see the beautiful 2 story great room with pillared architecture. The hardwd. floors flow t/o & the trim pkg is upgraded. Ceiling architecture/elevation is upgraded with skylights. Remodeled wet bar & central speaker system make for entertainers delight! Enjoy your master bedroom F/P. Dual staircases to make your way upstairs where you'll find 3 more BR's, a bath & large loft.